From the lay of the over-world to the very intro sequence and menu music, The Legend of Zelda: A Link Between Worlds is as much an homage as it is a sequel to A Link to the Past. The entire framework remains unchanged from the 1992 classic, at times stopping just short of outright remaking the original SNES game completely. For long-time Zelda fans, this is nostalgia heaven. It’s no mere case of Nintendo preying on that nostalgia, though. In spite of its glaring familiarity, A Link Between Worlds heralds the first major attempt to shake up the formula since its predecessor introduced it. The changes are small, but their impact is significant. Because for the first time in years, The Legend of Zelda is experimenting again. For once, I have no idea what to expect from the series anymore. And that’s incredibly exciting. But most of all, A Link Between Worlds is an outstanding game. With tremendous pacing, excellent dungeons, and a greater focus on unfettered exploration, A Link Between Worlds strikes a fantastic balance between the old and new. The game picks up an unknown number of years after the events of A Link to the Past. This time Hyrule is threatened by a man named Yuga, who hails from the parallel world of Lorule running about turning people into paintings. Link, a simple apprentice to a local blacksmith, encounters the strange man while delivering a sword to the captain of the castle guard. He’s unsuccessful in stopping him, and so reports these unfortunate events to Zelda. From there, it’s off to save the world once more. It’s all standard Zelda fare, but with the bonus of being nice and brisk. A Link Between Worlds never wastes your time with exposition dumps or other long sequences of fluff, preferring instead to be quick and to the point. There’s no better example of this than the introductory sequence described above, which takes no more than several minutes at most to play through. Compared to the long slogs that were Skyward Sword and Twilight Princess, this is a much better approach, allowing you to get straight to the action with minimal hassle. Seriously – as soon as Link obtains his sword, you’re given free rein to go wherever you like. The game never tries to herd you away from anywhere, obstacles requiring certain items to overcome the only roadblocks you encounter. Sounds like a small addition, sure, but it also invokes one of the long dormant tenets of the series: exploration. Not since the very first game have you been able to travel one direction just to see where it leads. The series has become increasingly linear and restrictive, never letting you go anywhere without its express permission. Skyward Sword was especially egregious in that regard, never letting you even think about straying from the path ahead until it decided it was suddenly okay. 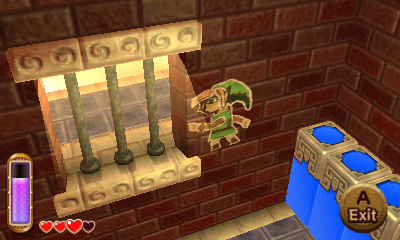 In A Link Between Worlds, you never run into that. Every region can be sought out long before you ever need to visit them. Sure there’s still a fair number of boulders, chasms, and other such things blocking your path, but they’re merely for the countless secrets hidden throughout the game world(s) and only those. As such, A Link Between Worlds becomes the first game in the series in a long time to truly capture that grand sense of adventure and wonder that made the franchise famous in the first place. This freedom extends to the very flow of the game as well. Instead of being forced to follow a linear sequence of dungeons like before, A Link Between Worlds allows you take on each one in whatever order you choose, changing the very nature of their puzzles in the process. In the past, dungeons followed a very rigid formula of “enter, find the item, use said item on puzzles and to defeat the boss, as well as to access the next dungeon,” and repeat. Here, that’s not the case. I mean, yes, they still revolve around a specific tool, but not to the same degree as in previous games. They’re now but a mere part of the equation instead of the sole answer. Usually dungeons acted as a sort of training ground for each item. When you get the hookshot, for instance, the next few rooms are designed entirely around getting you accustomed with using it so that you’re better prepared for the remainder of the area. Not so anymore. 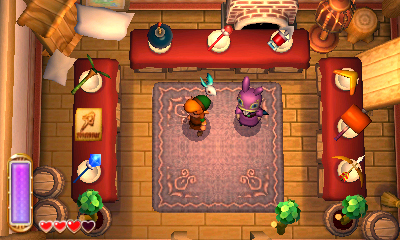 Instead of being found, Link’s toolset is rented/bought from a merchant named Ravio who sets up shop in Link’s house. This serves as the crux for how the game ditches the series’ old design principles, how it makes the whole world open right from the get-go. And because of it, the ways you learn to use these items comes through sheer use and experimentation rather than a pseudo-tutorial of sorts, allowing each dungeon to skip straight to the good stuff. They’re briskly paced this time out, each able to be finished in as little as 20 minutes, easily. But they’re also tons of fun and incredibly well-designed. Puzzles show a touch of variety now that they aren’t slaves to the items, each more clever than ever providing plenty of inventive problems and solutions than ever before. 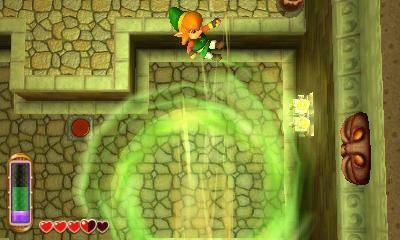 Much of this stems from Link’s new ability to merge with walls, adding an extra dimension to consider. Often whenever you find yourself stuck, the solution ends up involving this ability. From simply using it to cross otherwise impassible gaps to more creative uses like firing the hookshot to pull Link toward a wall to then immediately merge with it, or even to sneak up on unsuspecting foes, the applications are numerous and enjoyable to use. It also acts as your means of moving between Hyrule and Lorule. Throughout the two lands are small cracks in the walls, which act as portals between the two worlds. Both differ greatly from each other. Where Hyrule is bright and lively, Lorule is dark and treacherous; where Hyrule’s landscape is nice and pristine, Lorule’s is broken and divided, plots of land separated by seemingly bottomless pits accompanying the gloomy color palette and grim visuals. Even the music carries a strong sense of danger, whereas Hyrule’s remains ever triumphant and adventurous. It’s all highly reminiscent of A Link to the Past’s dark world, only with a much starker contrast in its landscape. Hopping between the two worlds is key to traversing them, Lorule especially. As the land in Lorule is divided, you can’t just walk everywhere. Your first means of accessing new areas come through finding portals in their Hyrule counterparts, all typically situated in obvious spots. Once you’ve arrived, it’s simply a matter of finding the weather vane in that area to unlock fast travel, allowing you to easily zip about the world in an instant. Further streamlines exploration nicely as well, as it eliminates the drudgery of always having to walk everywhere while looking for secrets. A Link Between Worlds is a marvelous game on all counts. Exploration is front and center again and better than ever, letting you wander about as you please as much as you want. Dungeons feel fresh now that they’re no longer ruled by the confines of Link’s toolset, the puzzles using said tools equally inventive. It all comes together splendidly to make the best Zelda game in years.